The awakening of TV to the 21st Century ...Real Soon Now? CoTV was ahead of its time in 2002... Now the stars may really be aligning for TV "companion" apps. When I talked about CoTV to people at major TV and Web companies in 2002-5, they thought it was a good idea and assured me "Yes, I get it." Some did, and some just thought they did. Like all forms of "interactive TV" it has been "just around the corner" for many years "waiting for the stars to align." But now the stars really do seem to be aligning. iPad has awakened he giants: Comcast, Time Warner, TV networks, TiVo, and many others are jumping into coactive "companion" apps for tablets (and phones). iPad and other tablets are nearly ideal companion devices, and already in millions of laps. Platforms for interaction (CableLabs/Canoe, ETV, EBIF, ...) are enabling real innovation and increasing openness from within the distribution establishment. EBIF is in over 20 million homes, and growing rapidly, not only in cable systems. ETV is getting real. The PayPal Buy Button is a nice example. Over-the-top alternatives are real -- the incumbent system operators know they need to get into the 21st century or watch their content distribution business get bypassed. External plays based on TiVo, Blu Ray (Pocket BLU), and sound recognition (Spot411 Entertainment Tonight) show how this can be done outside the cable plant, even for shows distributed on cable. Social TV apps (about what you are watching now) are making the viewer value proposition even more powerful. What is missing is for a smart player to provide an "always-on" TV sync connector -- a single app and context portal that drives any companion content for any show (and any ad) to a large base of households. The problem has been that nearly all attempts to provide TV companion apps have been siloed, and limited to a single program or network. In the early 2000's ABC ETV and Goldpocket did second-screen companion apps for major network shows (Millionaire, Sunday/Monday Night Football, Academy Awards, etc.) but only if you navigated to an ABC or program-specific Web site. Up-take was rarely even 1% of viewership, hardly a basis for a business. Now iPad and iPhone apps are creating similar experiences, but for the most part it is still a different app for each show or network. How can anyone really expect significant uptake when users must know there is a particular app, bother to get it, then bother to use it, and then do the same every time they change channels or programs? Even now at TVOT, I spoke to someone from Canoe who seemed to think I must be some kind of idiot to view this as a problem. Saying (my paraphrase): "The user can just get the right app, or just go to the right Web site. That BMW ad you want to sync to is a network ad, not a cable ad, so the network has to provide the app -- or the viewer can just go to bmw.com. That is simple -- why can't you see that???" One more time: The viewer should not have to switch from a Comcast app to an ABC app to an MTV app to a BMW app (or enter a different URL) every time a program or ad changes. Only when there is one app (or Web portal) that seamlessly syncs enhancements for any show and any ad will this be easy for the viewer. I should just be able to turn enhancements on, and have them appear on my tablet with no further effort (until I turn them off). And when it is that easy, companion enhancements might quickly grow to 10-20-30% of viewership or more. Just the linkage revenue from linking those ads would be worth many billions. So does anyone get it yet? Yes. My contacts with well-placed industry players indicate that more and more of them now do get it, and some see it beginning to happen in the next year or two. The cable operators have finally recognized that set-top boxes are good MPEG engines, but hopelessly inadequate platforms for user interfaces, and that they must open up to partners using Web-based technologies. Canoe is seeking outside partnerships and ideas. Maybe the system operaors will actually do what they need to do. One interesting hint of this new direction is the eBay companion TV app, which can sync an iPad with any program on an EBIF-enabled set-top. A demo by RCDb at TVOT Intensive showed a similar app for syncing iPad enhancements to deliver IMDB pages and other content. Cable operators are starting with companion program guides, but a program guide that does not know what you are watching right now is pretty lame (as they are aware). Once they provide that added smarts to the companion, linking to program-specific enhancements will be (relatively) easy. And if the distributors do not get their act together, outsiders will do it. The Spot411 effort shows one approach, and there are many others. TiVo is well positioned to do it (and could still win big if it did). And if it comes too slowly to the legacy providers, the IPTV players will soon have enough viewership on big screens to lead the way. So who will it be that realizes this is a critical race, does it right, and wins it? TV is ready to be reborn for the 21st Century. Once someone makes it easy to use across the board (and does not cripple it), it will happen very fast. I have started a new blog for my latest project, which I think is very exciting, and will be posting more actively there. This project is called FairPay, which is a radically new adaptive pricing process that I think has great potential, and both business and intellectual interest. I also have a mini Web site devoted to FairPay. The Internet has led to a crisis in revenue models for media/content -- but the Internet also enables a way to create a radically new kind of pricing process. What is needed in a revenue model, is not to choose the right price for digital products (free or not), but to create an adaptive pricing process. Selectively offer to let the buyer set any price he considers fair after the sale (Pay What You Want, post-sale). Let the seller (or a collective of sellers) track that price and use that information to determine whether to make further offers of that kind to that buyer in the future. Instead of a fixed price, this process generates a cooperative and adaptive series of pricing actions, each based on feedback on how fairly the buyer sets his prices. Call this enhanced process Fair Pay What You Want, or FairPay for short. Because FairPay variations on Pay What You Want set prices after the sale, the buyer can have the product, use it, and verify its value, with no risk -- and then pay whatever he thinks fair. By adding FairPay feedback, the seller gains reduced risk and indirect control. The buyer develops a history, a FairPay reputation, that affects his future opportunities. That gives the seller the control needed to make FairPay offers only where his expected risk/reward profile is attractive. Instead of static pay walls and freemium schemes, this process supports seamless and dynamic hybrid models. Those who pay fairly, rise above the pay wall -- those who do not, must face it. 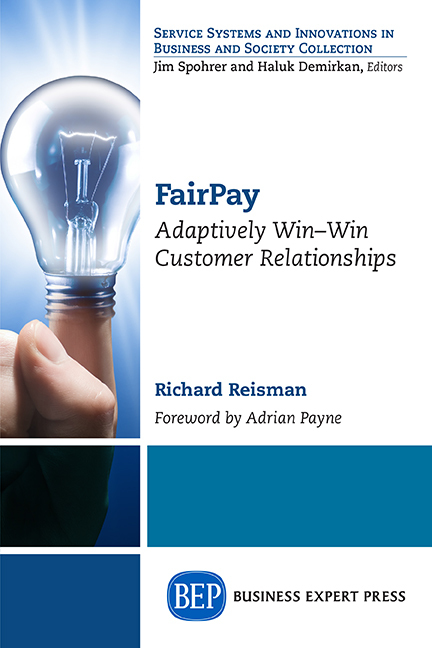 FairPay creates a win-win dynamic that can make both buyers and sellers much happier, and the economy much more productive. Sellers can profitably sell to everyone who sees a potential value, at a price corresponding to the perceived value to that individual buyer. Some will pay well, some will not. But sellers can expect that many more people will buy, and they will pay a fair price because their reputation is at stake. FairPay can take many forms, and can enable free sampling and blends of free and paid that are more dynamically adaptive and effective than ordinary “freemium” models. The result is that total revenue, and total profit, might be significantly higher than with a fixed price (at least for products with low marginal cost, as with digital media) -- and that total value created can be maximized. A fuller introduction to FairPay is provided at the FairPay Web site. Building on Google TV: TV meets Webpad. Webpad meets TV. As the Google blog says, "these features are just a fraction of what Google TV can do." One hint, reported in the Wall Street Journal, is that "Linkages between Android phones and Google TV bring some unusual benefits. A Google engineer, for example, demonstrated how a person could use voice recognition in his cellphone to search for a TV program by speaking its name. I see this as an opening for the kind of rich "Coactive TV" (CoTV) applications that coordinate TV viewing with enhancements and controls on a second screen device, such as an Android phone or tablet or notepad. While putting the Web onto the TV is desirable for some use cases, the real opportunity for convergence is to coordinate a Web device with a TV device. This can provide content and Social Web services on a Web device that knows what you are watching (such as to tweet about a program), and let the Web device control what you are watching) such as to swing a video from your tablet or phone to your TV. Hopefully Google is well aware of this potential. I spoke to some senior people about these ideas some time ago (and as noted in a prior post, there is some interesting Google research, including a paper by some guy named "Brin, S"). But in any case, independent developers should be able to provide this (as long as the app police don't prevent them). As noted in my previous post, iPad is beginning to show what a Webpad can do as a second screen. Google TV seems another big step in the right direction. The 5/12 announcement of Comcast's Xfinity iPad app, and comments by Time Warner that all cable operators are going to have similar offerings, looks like a big step toward a platform for Coactive TV on a mainstream basis. Two videos show the current steps. First, this looks like a major step to position iPad (and presumably future tablets from other sources) as a well-integrated second screen for use with TV viewing. It will offer a rich remote control usable on the sofa for enhanced control of the big-screen TV, with full program guide and DVR control functions having an excellent UI, including its handy soft keyboard. Second, it looks like a first step toward a simple coactive Social Web app. The Comcast demo shows how it lets you send an invitation to a friend, so he can tune in to the program you are watching with just a single click (if he has equivalent service). iPad looks like a poster child for the kind of Webpad that would be an ideal second screen for Web services related to what you are watching on TV. With this device, and the level of TV context awareness in Comcast's demo, it would be very easy for the cable operators to add a full suite of coactive services. This could enable the iPad to show arbitrary Web content related to what you are watching on your TV. Some related news that is also encouraging in using such mainstream devices as TV adjuncts is from Crestron. This leading high-end whole house entertainment control company is embracing iPad as an alternative to its very expensive custom tablet remote controls. Coactive viewing of TV and the Web -- the stars are aligning? MTV, Sony, Verizon, Twitter, Facebook and others are moving into position. Some of the stars seem to be aligning, even if the full impact is still mostly unrecognized (even by many of them). Much of that is driven by the Social Web -- tweeting and IM-ing about the TV shows (or other video) we are watching. Some of it is driven by other services, such as looking at IMDB or other Web content related to what you are watching. Some basic aspects of this are now widely recognized, as noted in a 2/14/10 front page NY Times story: Water-Cooler Effect: Internet Can Be TV's Friend. There has been a drumbeat of announcements by large and small players in support of this. Some are specific to a particular TV program, but some recognize that what we really need is a platform that works for whatever we are watching. Just as with the Web, what we need is not isolated apps for each program or network, but a platform that, like a browser, works for any content. You don't get mass audiences on niche platforms! I have been seeking to develop such "Coactive TV" services since before 2002, and am happy to see more and more steps toward that vision. One of the most important milestones is the Verizon FIOS Twitter and Facebook widgets. These are TV widgets that run on your TV (if you have FIOS) and can be triggered to sense what program you are watching and send a tweet or update your Facebook status to inform people that you are watching it. Right now, these are for interaction on the TV, with limited integration with a PC or phone. -- That should be easy to add -- all it takes is a widget that talks to a Web server that coordinates other Web services with whatever is on your TV. There is no limit to what the Web services might be. Wouldn't someone like to be in the middle of that dynamic? ...Verizon? ...Anyone else? Another interesting step is by a startup called Spot411, that uses audio recognition to figure out what TV program or DVD you are watching, and link you to a Facebook page with others who are also watching that. They got some visibility with a PC and iPhone app done for Fox DVDs that is called FoxPop. Now they are doing the same thing for TV. These guys get the idea that we don't want different apps for each show -- we want one app that works for any show. Sony is doing an interesting variation for their Blu-ray discs, building on BD-Live Internet connectivity. It started as movieIQ, announced last June with IMDB-like information from Gracenote (the people who tell your PC what song is on the CD track you are playing). Soon they will be adding an iPhone app called movieIQ sync that will let you get the movieIQ information on your phone. Great for Sony discs, but what about all the rest? Repeat: You don't get mass audiences on niche platforms! Many media companies have iPhone apps that tie to their specific TV programs, DVDs, or games. Repeat: You don't get mass audiences on niche platforms! Miso is an app that lets you "check in" to any TV show or movie and send it to Twitter, Facebook, or foursquare. You have to manually enter or find the show (unlike Spot411), but it is an interesting start. MTV is one of the first of what may be a wave of companies building similar apps for the iPad, which they suggest "could be the appendage that makes interactive TV a reality." A nice start but...One more time: You don't get mass audiences on niche platforms! Thinking about The Internet of Things, as IBM is promoting it, it struck me that my recent automotive service experience was a telling landmark in the coming of the new order. My new 3-series has a BMW Assist feature with its navigation system that lets you find a destination on Google Maps in your home or office, and then send it to the car, so the guidance system can take you there. After a couple phone calls while working on my car (over the course of 3 days), the dealer service rep finally called to say the messages were there, but that it was hard to find them (he had never worked with the feature before). We assumed I must have been looking in the wrong place. He suggested I come in for instructions, but I suggested I call from the car when I could. BMW needs to hire some people from Apple to work on UI, but wait, there is more..
After getting the car back and sending it a new destination to look for, I got in and looked around, starting with the same menu selection I had looked into before ("BMW Assist/Messages"). Lo and behold: there were my previous message, a couple dealer test messages (opened), and my new message (unopened) -- right where it kept saying "No messages" before. I can only conclude that the car had been fine, I had been using it properly, and something changed on BMW's end (either in some server, or in the setup entered into some server by BMW Assist staff. Imagine the cost of sending thousands (eventually millions) of cars into the shop for problems that could be diagnosed and fixed remotely! BMW does not yet realize they are in the network services business (and selling network node devices). I hope they realize it soon. Internet of things, Internet of computers, Internet of people. ...Convergence every which way ...I can't wait for the next release. This blog is now located at http://ucm.teleshuttle.com/. The bad rap on so-called "patent trolls" is nicely countered in this 2/1/10 Business Week article by Ron Epstein. My exerience in this area supports Ron's arguments, as was summarized in my 2008 post "'The Six Phases of a Technology Flop' ...Patents, and Plan B".